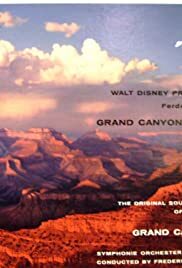 Scenes from the Grand Canyon set to Ferde Grofé's "Grand Canyon Suite." Music by Ferde Grofé Sr.
An uneven but beautiful attempt to do an early widescreen "music video" with Grofe's Grand Canyon Suite. The musical sequences are competently performed, though edited for time, and they do not appear strictly in order. What matters about this film are the visual elements. The Painted Desert sequence is as beautiful yet austere as the music, however it drags a bit. In the "Sunrise" sequence a trip down the Colorado climaxes in shooting the rapids. Innovative, but the constant downward angle with no sky ahead becomes claustrophobic. Just when you think it's going to be a so-so movie, it picks up beautifully as "On the Trail" displays the wildlife in a sensitive, natural and compelling way. The sunset and cloudburst sequences--well--see it for yourself. I won't spoil it for you. The movie involved a lot more thought than it appears. Finally, they released it in widescreen on the Deluxe Edition DVD of Sleeping Beauty. A long overdue reissuance, and very appropriate since they debuted together in the cinema.